It's holiday season and progress slowed slightly during the month but changes are still noticeable. The new hospital is looking resplendent, especially when the sun is shining! Across the street from the hospital on the Littlecombe site a new terrace of houses is being constructed and this whole area of the old Lister site is looking decidedly more established. Elsewhere in town, work continued on repairing the roof of the house in the Broadwell which suffered a fire and internal progress is being made on Reid's, the new Italian restaurant near the May Lane junction with Parsonage Street. Progress on Dursley's new community hospital. Just across the street from the hospital a new terrace of houses is being constructed. Scaffolding surrounds the house on the Broadwell path to St. James' Church. The repair work following the fire is almost complete. Viewed from the car park of Lloyds TSB Bank, Jacob's House on the right can be seen with its new coat of paint. 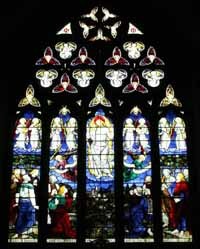 View out of the large East window of St. James'.